Miss Edna's Place: Tis A Bit Nippy This Mornng! Good morning. Goodnesss, it feels almost like winter this morning. Right now, the temperature is 35F degrees. Brrrrr! It should warm up to about 57F degrees later today. The next four or five days should be warmer, in the sixties and seventies. Last night I had to put the heat on in the main house. Temps dropped down into the upper thirties. Tomorrow I'll be able to shut it off for a few days. Well, I don't know if yesterday was a good day or a so so day. I had planned to do a bit of vacuuming, but I got side tracked and never did get to it. I was on the way to get the vacuum, but instead decided to get rid of a pile of junk mail, magazines and catalogues. A couple months ago, I decided to hire an outside shredding company, and so I've been saving all this stuff up till I had enough for the shred truck. However, I called the other day to make sure they could shred all the magazines and catalogues, and they said "no, they could not." Aye yi yi! So, yesterday I started going through all this stuff. Mail and personal information went into a large trash bag, and magazines and catalogues (minus my personal information) went out to the recycle bins. Unfortunately, I can only sit or stand in any position for a few minutes before the pain starts up. My body was rebelling. Once the pain started, the spasms in my neck also started up. I ended having to take pain meds twice yesterday. This is unusual as I usually just sit for a while and ignore the pain. But I was already sitting so the meds were necessary. However, I did manage to fill a trash bag halfway with shred material, and I tossed three big bags of magazines and catalogues out into the recycle bins. So I guess it wasn't such a bad day after all. Remember last winter I said that I was going to order some courses for writing that were on sale? Well I never did get around to it. 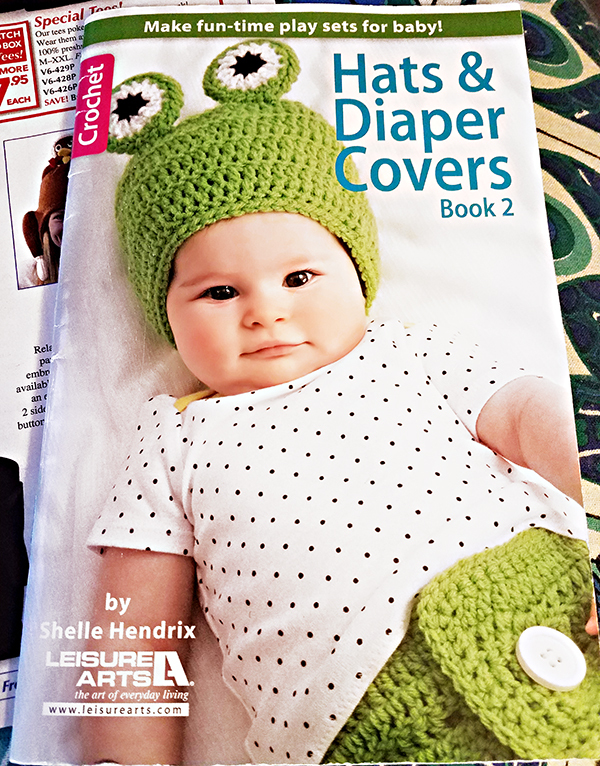 A few days ago, I got a catalogue in the mail from this same company, and the courses that I wanted are on sale again. The courses are 80% off until October 26th, for new customers only. Yesterday, I went online and ordered two courses on DVD's and they each come with a lesson book. I ordered "Writing Creative Non Fiction" and Writing Great Fiction." I may or may not do some writing later on, but I'm going to enjoy learning how to do it. If anyone is interested, their web address is: https://www.ordergreatcourses.com. 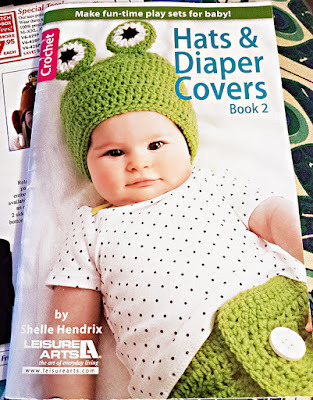 When Pogo and I were shopping at JoAnn's Fabric store the other day, I picked up a pattern book for baby hats and diaper covers (also known as nappy wraps). These are all size 3-6 months. I bought another pattern book from Amazon with larger sizes. 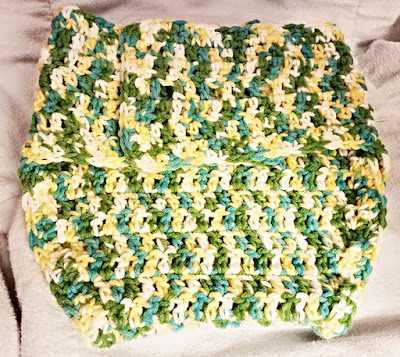 Last night I thought I might take a break from my afghan and try this nappy wrap pattern. Here's my first try. It's not finished yet. I still have to buy a button and snaps. It is rather cute though. 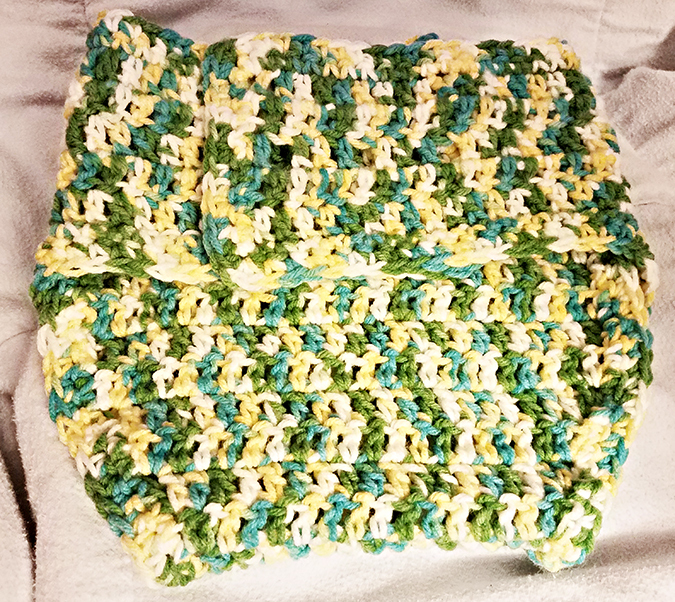 I think I'll make a couple more of these and give them all to Xander, my newest great grandson. I may even make the matching hats. We'll see. Today I'm sharing an image that I borrowed from a friend's blog. 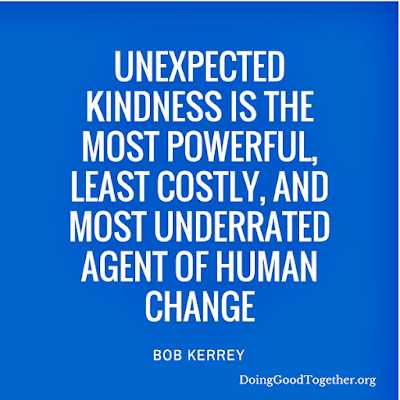 This is something that I believe in and I practice it as often as I can. 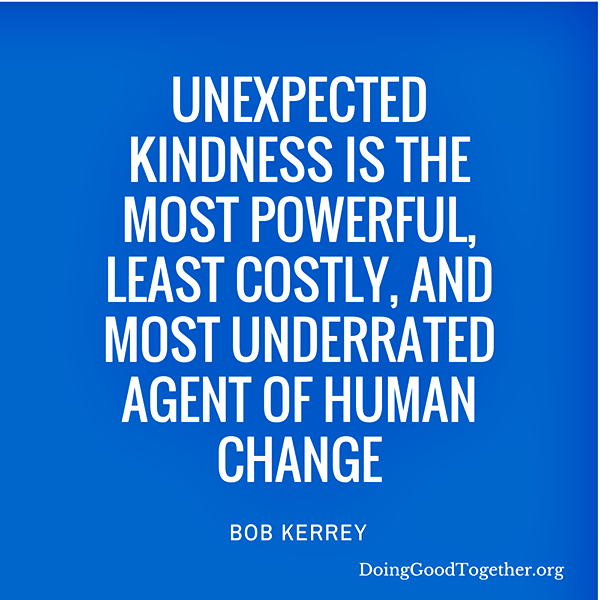 Sometimes, the tiniest bit of kindness can make another person's whole day seem much brighter. Well, I think I should get busy with my "chores" before I run out of steam. I did not sleep well last night, so my energy probably won't last very long today. On that happy (?) note, I'll take my leave. So, till tomorrow, Y'all have a fantabulous day. Oh dear, you shouldn;t strain your body so much that you are in pain. Isn;t there another way of getting rid of the magazines etc? I had to smile when I read household things aren;t your thing anymore. I often feel a bit the same. I am doing things that are needed, but not as often as I perhaps should. And at this time, I have a bit other things to be busy with, and the big cleaning bit can wait for now. Not good I know, but there isn;t enough energy in me at the moment to tackle it thouroughly. Oh, don;t worry, you can still walk through the house without meeting big piles of dustbunnies etc. So it is still rather safe LOL. Hopping on to your next feww posts, trying to keep a bit updated.